Mother’s Day, like Valentines, Christmas or birthdays is an annual hurdle all bereaved parents must face and is unavoidably a public occasion. So what happens? What do you do? How do you get it right when someone important to you is struggling this Mother’s Day? There are no simple answers, exact idea or blue prints, on either side. Sometimes it is the simple, small gentle moments and acknowledgment that matters. 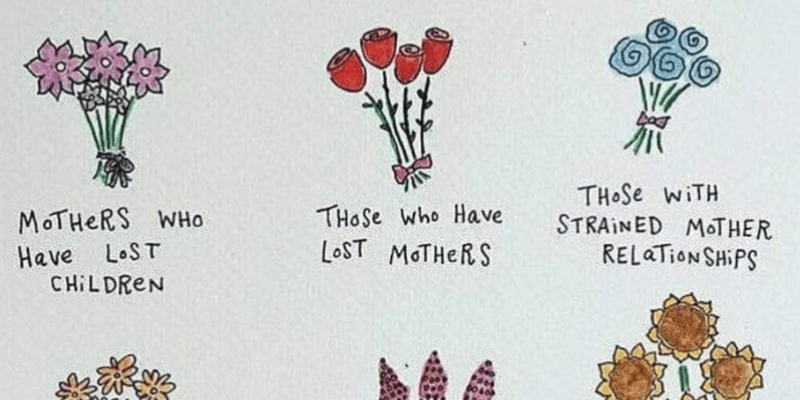 Here are some simple ways to support bereaved mothers on Mother’s Day. The run up to Mother’s Day, particularly the first for a bereaved parent is incredibly difficult and full of a range of emotions and decisions around the day. Sometimes all they need is just being there as a listening ear, checking in on the run up to Mother’s Day. Maybe you could ask the dads their plans or just send a ‘thinking of you’ text when you see cards for the day appearing in the shops. It could be as simple as sending a text reminding the person you are there if they want to give you a call. Staying in touch with bereaved parents, however un-responsive they may seem, is incredibly important. Sometimes things like this are all you can do and it does make a difference. Sometimes simply being there or showing that you remember is priceless. Mother’s Day a marker on everyone’s calendar and it should be no different when thinking of bereaved parents. So don’t be afraid of bring up the day. Ask about their plans or ask if there is anything you can do that the bereaved parents would find comforting. We are all mothers and all mothers love to talk about their children, it is incredibly important for bereaved parents to have the same opportunities to talk about their children as any parent and it is important that this exists all of the time, but particularly on or near Mother’s Day. Why would you not? Every mother regardless on their experiences deserves a card and flowers. I know it can be difficult to choose a card, but you know the person the card is for and will know what is best. A Mother’s Day card, a beautiful blank card or a thinking of you card, beginning with a short note acknowledging that this day is hard but that you are thinking of them and their baby does really make a difference. For me as a lone bereaved parent – I find having to spend certain days alone or knowing that I have to face doing something on special days alone, or after, can make it all more challenging. I also find it is good to have a little distraction or some part of ‘normal’ on or just after significant days. So for me one of the best ways to support bereaved mothers on Mother’s Day this year is make sure they’re not alone, or offer your holding hand in doing a little something to mark the day. Be with us even if we are not much fun, your friendship and support, is so much of what we need. To understand the new normal of life as a bereaved parent from the outside is a very difficult thing. Often bereaved parents feel ignored or excluded from celebration days such as Mother’s Day. But the loss of a child is life changing and I think it is important on a day that celebrates mothers, to take a little time to try to empathise with those mothers now living on without their children. This coming Mother’s Day, let’s remember and support all mothers, in whatever way you can.